It happened again: Another kitten snuck under the hood of a car and took an unexpected road trip. Jodi McHenry of Howard Wilson Chrysler Jeep Dodge points to the spot in the Corvette where the cat was stuck. According to WAPT News, a 5-week-old feline nestled herself behind between the dashboard and the engine of a 2007 Corvette. The vehicle’s owner then set out from New Orleans, La., to Memphis, Tenn., not knowing there was an unexpected passenger. During the trip, the driver kept hearing a noise from the engine area. Stopping in Flowood, Miss., he took his car to a Dodge dealership. 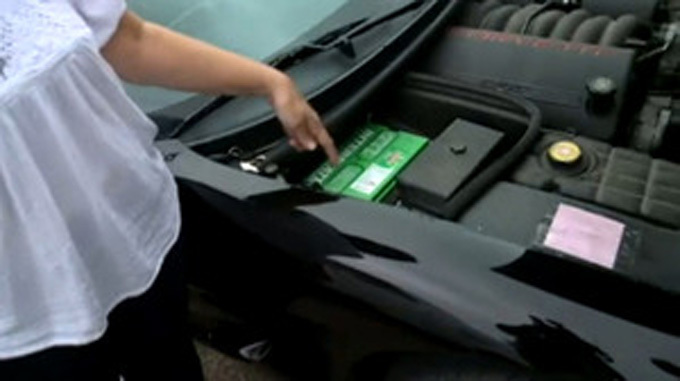 Mechanics who examined the car discovered the source of the noise. After removing part of the front of the vehicle, the cat was free. Rescuers estimate the cat survived 200-degree temperatures during the near 200-mile trip. “It had gotten very hot, she could have been put to death, she is extremely lucky – she could have fallen,” Elizabeth Jackson of Animal Rescue Fund of Mississippi says. “I guess the only thing that made her survive or help her to survive was the wind coming through the engine compartment.” The cat was dehydrated, but otherwise unharmed. The driver passed on adopting his reluctant passenger and the kitten went to ARF of Mississippi, where she was named Gigi, which is short for Gloria Gaynor. Gaynor sang the chart-topping karaoke-favorite “I Will Survive” in 1978. The kitten has since found a home.